It's critical to stay up-to-speed in the hyper-competitive world of productivity apps and services, and to that end Box is announcing improved ways for teams - and individuals - to get work done. 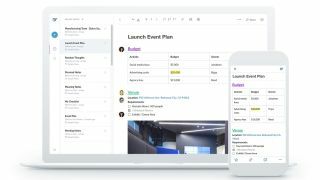 The file sharing and collaboration service revealed a redesigned web app and all-new standalone desktop app for Notes, its real-time teamwork tool that combines communication and documentation in one spot. As project lead Jonathan Berger tells us, think of this as Box Notes 2.0. Box Notes now features a more streamlined web experience, one that lets users view, create and edit notes from one browser window. A sidebar to the left gives users quick access to favorite and recently accessed notes, saving the trouble of searching around for them in folders or thumbing through notifications. As for the standalone desktop app, Berger says it's all about fast access. Now, users don't have to wait for the web to load or sign in whenever they want to access Box Notes, instead launching the app right from their Mac or Windows PC. You'll find the same features here as in the web app, and Box plans to add offline access down the road. Like Evernote or OneNote, Box wants this feature to help individuals jot down ideas whenever inspiration hits. Box prides itself on being built for enterprise with features like full encryption, and the upgraded web experience and new desktop app should offer users yet another way to get work done more quickly and with higher levels of convenience. The updated web experience will arrive automatically to users starting today, and the desktop app is available to download as well for free. Box says the offline desktop app experience will launch later this year.